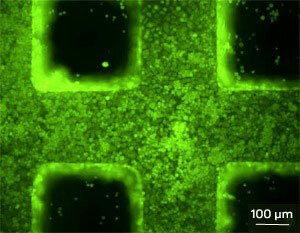 (Nanowerk News) The repair of organs, such as human kidney and liver, hinges on the development of three-dimensional (3D) tissue scaffolds with well-defined microstructures. Andrew Wan, Jackie Y. Ying and co-workers at the A*STAR Institute of Bioengineering and Nanotechnology have now developed a photolithography method that can be used to fabricate microstructured 3D tissue materials with high precision ("Three-dimensional microstructured tissue scaffolds fabricated by two-photon laser scanning photolithography"). "Fine microstructures are important as they allow us to better define the interactions between cells, which in turn leads to better scaffold function," says Wan. A fluorescence microscopy image of hepatocytes growing on a microstructured three-dimensional scaffold fabricated by two-photon laser scanning photolithography. Typical approaches for the fabrication of scaffolds involve physical processes that lead to poorly defined and heterogeneous pore geometry. One way to resolve this issue is to apply layer-by-layer methods, such as soft lithography, to form layered structures with microscopic internal patterns. However, the resulting materials lack the fine structure desired for advanced tissue engineering. Wan and his team developed a two-photon laser scanning photolithography technique to produce scaffolds with finer microstructures than can be achieved using previous approaches. The researchers adapted design and manufacturing software for the creation of microscopic objects to the conversion of a drawing of a scaffold into digital information. That information is then translated into an actual scaffold using the laser scanning process. The two-photon laser excites 'crosslinkable' molecules in the polymer to form a dense polymer network that replicates the computerized design. The scaffold can then be obtained by washing away the unreacted molecules using an organic solvent. The researchers successfully used their approach to fabricate a small cube composed of microscopic pores in just two hours. The scaffold reproduced the original design with high resolution and fidelity, and was also highly transparent and easily observed by fluorescence microscopy—a boon for monitoring cell seeding. The researchers evaluated the performance of the porous cube for liver tissue engineering and discovered that primary liver cells, or hepatocytes, cultured on the scaffold exhibited good cell attachment, viability and cell–cell interactions. Furthermore, unlike cells seeded on flat polymer surfaces, these hepatocytes produced more of the liver-specific compounds albumin and urea. As complex organs such as the liver consist of more than one cell type, the researchers are currently looking into ways of employing microstructured scaffolds to produce patterned co-cultures of cells. "These 3D spatially defined co-cultures would allow us to better reproduce the function of the tissue or organ that we would like to engineer," says Wan. The researchers add that this technique would be particularly useful for studying cell–drug interactions and developing effective therapies.